Dawn: Actually it wasn’t jewelry, my first job that lasted 25 years was Marketing Manager for Mobilite Exhibit Systems…our family business designed, manufactured and sold trade show exhibits all over the country. Ryan: How did your Jewelry business start? Dawn: When I retired from the Tradeshow Industry in 2001 and moved to Florida I was kind of clueless about what I wanted to do for the other half of my life, I knew I enjoyed sculpting clay from 5th grade so we went out and bought a kiln. My husband Don, took me to the Orchid Society and bought me a book, The World’s Most Beautiful Orchids by Greg Allikas & Ned Nash, so I started sculpting orchids in porcelain and selling them on Ebay but I decided I wanted a good pair of orchid earrings which was difficult to make in porcelain. So Don and I started looking for a solution on how to make jewelry. That’s when we found a jeweler who really liked my clay orchids. 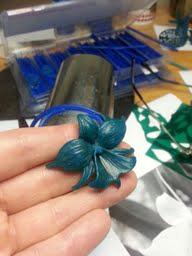 He explained how he made jewelry and then gave me three sheets of wax and told me to go home and sculpt a flower. Don was great, he took me to a jewelry supply store and he bought me everything I needed to make that first flower. 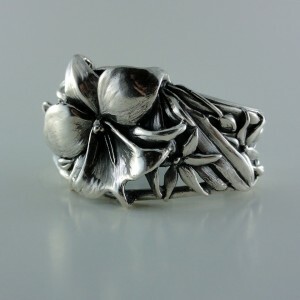 In about a week, I had sculpted my first piece, a Susan Fender Cattleya Orchid shown below. I will never forget my husband’s first comment when he saw this piece in wax on the kitchen table, he said; How did you get that, pointing at the flat sheets of wax, to look like an orchid? I just laughed and really was clueless myself, it was just inside of me waiting to come out but I remember when my hands touched the wax for the first time, I told myself…I can do this. The Phalaenopsis Necklace which was later featured in the St. Petersburg Times “Bay Magazine” in 2009 and won best of show at the Orchid Show in Miami. Ryan: How long have you been in business? Dawn: I’ve been making jewelry for about 6 1/2 years but art was in the family, my father was considered one of the best wildlife painters around. He started painting at 46 but only painted 6 paintings before he died. Each one of his paintings took a year to create. Dawn: Thank you, I started out using pictures found in books but living in Ft. Lauderdale, Orchids and Orchid Shows were everywhere in South Florida and my need for detail made me want to see them in person. So Don took me to an Orchid Show and my excitement was more than I could stand, I took a ton of pictures and then running back to my makeshift studio, I started sculpting ladyslipper pendants, cattleya rings, and phalaenopsis earrings…I loved orchids and I just couldn’t stop. I wanted to start selling my Orchid Jewelry at art shows and was invited to show my work in Jupiter, FL at the ArtiGras Fine Arts Festival as an emerging artist but it didn’t take long before some of the Orchid Art lovers were inviting me to show my work at the Orchid Shows…I was thrilled! 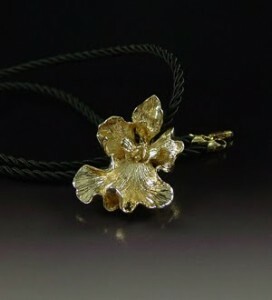 I became friends with many of the society members and was commissioned to make several pieces of jewelry as well as sculptures to be auctioned off to raise money for the American Orchid Society Education Research including the AOS 50th Anniversary where I sculpted a Oncidium Jiuhbao Gold ‘Tainan’ AM/AOS Pendant in 14k Gold. This was an honor! How Are the Jewelry Pieces Made? Ryan: The orchid pieces are so intricate. How exactly are they made? Dawn: It’s a process called “Lost Wax” The method goes back to the Roman days about 4000 years ago and is still used today for making jewelry. First, I sculpt a wax model which is also called a pattern, it’s first weighed so the amount of metal required to fill the mold (gold, silver, etc.) can be determined. Then the wax model is attached to a base, and a flask is slipped over the base. Once the model is in the flask, a kind of plaster that looks like pan cake batter called investment, is mixed up, put in a vacuum to get all the air bubbles out of it, and then poured into the flask. It is then left to dry and harden. This takes a minimum of two hours. Once the investment (cake batter) is dried, the base and flask are removed. Now the piece is put into an oven to burn out my wax model. Next a vacuum is used to force the melted metal into the investment mold. The Investment is washed away and then finally, the piece is cleaned up by filing and polishing it. Ryan: What materials do you use? Dawn: I use different metals, Silver is my favorite because it allows me to go bold with my designs. 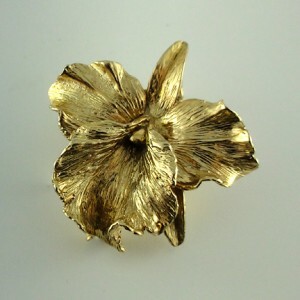 I also create pieces using gold and silver (two-tone jewelry) which adds character as well as depth to my jewelry. I also enjoy casting in Bronze…I have made several Orchid sculptures using the lost wax process and hope to make several more. Ryan: How long does it take to create one piece? Dawn: It depends, some pieces can be sculpted in a few days but in most cases, I would like to have a week and up to 4 weeks to make a piece of jewelry or bronze sculpture. It really depends on what the customer wants. Ryan: What’s your favorite orchid to recreate and why? Dawn: Oh definitely the Cattleya Orchid, I love the velvety ripples in the lip and petals but I always find something interesting in every orchid I sculpt, they are all so unique, that’s why I fell in love with Orchids. Ryan: Do you create jewelry in other forms? Tell us about it. 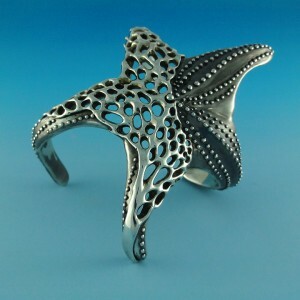 Dawn: Yes, I’m a huge fan of sea life, I enjoy sculpting jewelry to mimic Fan Coral, Branch Coral and all of the sea life that’s living in the ocean such as this Starfish Cuffs, it’s called the Fusion Collection, it’s a collection of jewelry that combines the Starfish and Fan Coral such as the cuff to the left. Ryan: What about custom jewelry pieces? Do you do pieces on commission? Dawn: I love making custom pieces, here is a perfect example of one of my commissioned pieces I completed a few weeks ago. 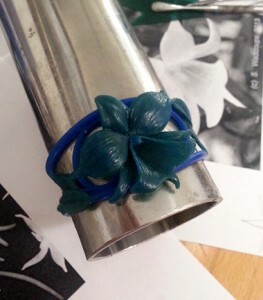 The client wanted an Orchid Cuff based on her favorite African Orchids. She had seen my work at a past orchid show and emailed me several pictures of her orchids. Once I saw her orchids I immediately saw the design in my head, no sketches were needed this time…but I did give her an example of a past tropical cuff I had made to see if the cuff’s width was doable for her. I always keep the customer involved in the sculpting process, I will send multiple pictures of the process to make sure we are on the same page. I started with the main orchid first and then made the base to the cuff. 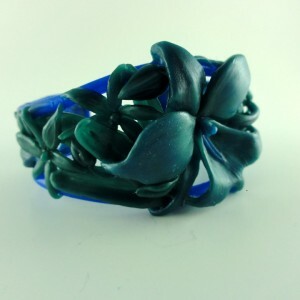 And here is the final Orchid Cuff in wax that I made for her. To the right is the cuff after the piece was cast in Sterling Silver, polished and then oxidized to bring out the detail. I am happy to say, Sarah was thrilled with her new cuff and so was I. How Can I Order One Of My Own? Ryan: What’s the best way for someone to reach you if they are interested in having your create something for them? Dawn: I love for people to go to my blog (www.dawnvertrees.com) where I show my work in progress including some of my finished pieces. I also have an Etsy site where I sell some of my finished work: My Etsy Store. I’m pretty easy to contact, you can reach out to me via my website or my Etsy Shop. I love pictures, so if you would like for me to create a piece of jewelry or a bronze sculpture for you, please email me and send those pictures if you have them, pictures speak volumes to me when designing an orchid piece. Ryan: Are you an orchid grower? Dawn: Don’t laugh but no…I can barely keep a pansy alive but all of the orchid friends have told me, it’s OK…for me to just keep on sculpting. Ryan: How many orchids do you currently have as models? Dawn: I have several orchids, as soon as I sculpt the orchid based on the live plant, I give them to my mom, she has a wonderful way of keeping them alive…at her house. Ryan: What’s one of the best orchid tips or tricks you’ve picked up along the way, that you think would be helpful to share with folks? Dawn: I just want to give a shout out to all of those Orchid growers, who love their passion and to allow me to create a piece of art for them…every piece has been a pleasure. Thank You! 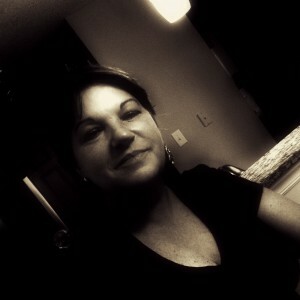 Dawn Vertrees is a jewelry designer from Cornelius, North Carolina. Her intricate orchid jewelry pieces have been featured by the American Orchid Society and have won numerous awards, including Best in Show in Miami, FL. 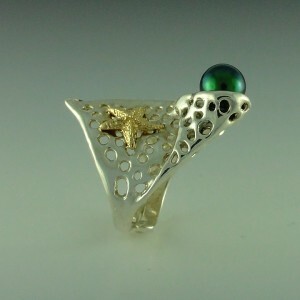 Each piece is created using a process called ‘Lost Wax’ from silver, gold, and/or bronze. Be sure to “LIKE” her on Facebook to keep up with her latest works. And remember, by signing up to the Green Thumb Club today, you’ll save 10% off everything including custom work and Free Shipping in the USA at Dawn’s website. After becoming a member, you’ll get access to a special coupon code (not available to the public) which you can use to get the discount off her site.